The job of the private eye is an exciting endeavor and the dream of many people with a soft spot for adventure. It typically involves finding missing people, unraveling hidden documents, and resolving crime cases. Private detectives often execute investigations for insurance companies, legal counselors, and even private individuals. Being a private investigator is indeed a thrilling occupation. However, it also involves taking care of a long list of administrative steps that ensure you are suitable for this profession. As a private detective, you may work at an agency, be self-employed, or work at law enforcement organizations. If you’re planning to dive into it, here you can find a step-by-step guide on how to become a private investigator. You will learn various details about the process, including how long does it take to start your professional path, as well as how much it may cost. If you’re wondering how to become a private investigator with no experience, there are ways to realize your goal. The first step in your new venture is to enroll in a program or a training course that will equip you with the needed knowledge and skills. A formal university education is typically not required. However, most up-and-coming private detectives have a Bachelor’s or Master’s degree in criminal law, criminal justice, police science, or a similar specialty. The university learning hours can also count on as work experience towards the state licensing requirements. Having a degree will certainly kickstart your career, but you can also opt-in for shorter training. There are a number of courses out there that can give you the basics about private investigation. Just make sure the course you select is accredited by a professional organization of investigators or an accreditation body. One of the most important criterion for being able to start your career as a PI is to have a clean criminal record. In the U.S., it’s mandatory to pass successfully the background check and fingerprinting if you want to become a private detective. In order to get your PI license from the relevant state authorities, you will have to undergo a rigorous procedure. Typically, the state Department of Public Safety or a similar body is in charge of overseeing the activities of private detectives. The licensing authority imposes a number of requirements that you have to meet. By fulfilling them, you prove you are suitable to take on the job. In most states, private detectives need to obtain a private investigator bond as a part of the licensing. You will also need to showcase your on-the-job experience. You will need a special permit for a concealed weapon if you want to have one. You can review the requirements for obtaining the permit per state. Keep in mind that many states would not issue such a permit to non-residents. For most newbies in the field, the best first step is to get hired in a private investigation agency for an entry-level position. This gives you access to real-life cases while having the chance to learn from weathered professionals. In fact, you may be required by law to gain a few years of experience before you can get a proper license for a PI. Once you’ve earned a couple of years of practical knowhow, you can make the next steps, such as becoming a self-employed private detective or even expanding your activities by launching your own agency. Need more information on how to obtain your private investigator bond? Our experts are here to help. You can reach us at 877.514.5146. 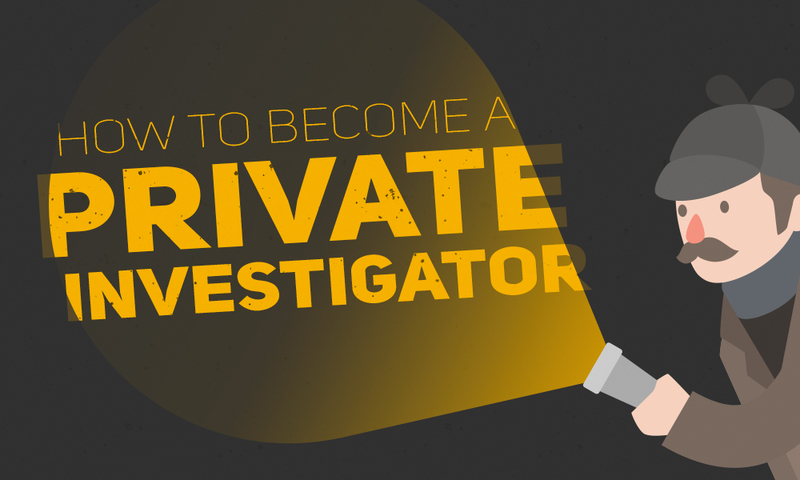 To get all of the tips on how to become a private investigator, be sure to check the infographic below! Please include attribution to suretybonds.org with this graphic.